I have finally made a decision on the sensor and ordered the Intel RealSense D435 Depth Camera! I also found high-quality CAD models of the whole D400 series here: Production CAD Files for Intel RealSense D400 Series. After importing into Fusion 360 and adding a touch of texturing, I added it to the robot model to show a sense of scale. It needs a 3D printed mount to be properly attached to the top of the front body; or better yet, a re-design of the front bumper to integrate the camera inside it, giving an unobstructed forward-facing view. The camera will be controlled by PC/laptop for now, but will later need to be controlled by a beefier on-board controller. This entry was posted in Robotics and tagged 3D sensor, AX-12, Bioloid, CAD, Intel RealSense D435 on December 26, 2018 by dxydas. In this post, I’ll be describing the first stage in getting a working representation of the, as of yet unnamed robot, into the ROS world. I will also be briefly exploring the MoveIt! library, as this might be a useful tool for the future. The virtual representation of the Bioloid will be built using CAD models of all the individual servos and support brackets. The robot will be loaded up in RViz, where its links an joints will be manipulated. Inverse kinematics will hopefully be calculated by the MoveIt! package later on. But first, a definition is needed of how the joints and links are all connected, and how to move between their frames of reference. The individual CAD components will be oriented correctly onto these frames. On a side note, I had the chance to photograph the Bioloid in its current state, and also had a Raspberry Pi 2 delivered! After some background reading, I found out that the best way to create this representation in ROS is by using a standardised XML format file called the Unified Robot Description Format (URDF). In the past I had made a start on drawing a CAD model of the Robotis servo, but since then Robotis has released CAD drawings of all their robot kits online here (old link). I tidied up the .stp files using FreeCAD, by removing some placeholder parts or sub-parts which would be of no use (e.g. screws, gears and electronics on the inside of the servos and CM-5). I then converted the files into .dae (Collada) format, and imported them into Blender to add some colour textures. For some reason, saving again as .dae in Blender shrunk the model dimensions by 100. I haven’t worried too much about the actual component size at the moment, as only their relative scales have to be correct for now. There is also a bug in RViz which replaces the ambient color of Collada materials by light grey if at least one component of the specified ambient color is 0. To fix this, I manually edited the file and replaced all 0’s with 0.1 in the “ambient” tags. Below are some of the main components, as rendered in Blender. Creating the file for the Bioloid took a fair while, as I created all the translations by eye without knowing the actual distance measurements between the various links, but rather by relying on the CAD components as each one was placed in the chain. I started with the right side of the model, first with the easier arms, then with the legs. The validity of the URDF file can be checked with teh check_urdf tool. 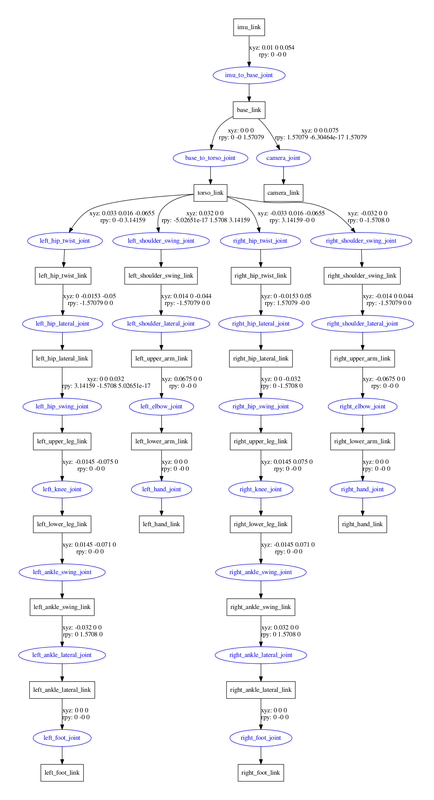 Another great tool for visualising the final result is urdf_to_graphiz, which generates a diagram of the joint and link tree. The tree of my model is shown below. Each joint (blue circles) is positioned with respect to its parent link (black rectangles), and the following/child link is positioned has the same origin as the joint, as shown here. The xyz and rpy labels next to the arrows show the translation and rotation required to get from parent frame to child frame, or in other words, it is the representation of the child’s frame with respect to the parent’s frame. You will also notice the addition of the IMU link, as well as an additional camera link, although this is just a placeholder for a possible camera in the future, and at the moment won’t be used. The current state of the robot is shown in the screenshots below. The robot is displayed in RViz with the help of the ROS joint_state_publisher and robot_state_publisher. It is fully articulated and the individual joints can be moved with the help of the GUI which joint_state_publisher provides. The joint states will later be published from the joint values read by the real Bioloid servos. In addition to the kinematic model, I created bounding boxes around the components for the collision boundaries, which are shown in red. This was after the fact I realised that without them, the MoveIt! plugin would use the full CAD geometry in its collision detection routines, which made it almost grind to a halt! I have only played around with MoveIt! briefly so far, but the results seem very promising. The library has a useful graphical setup assistant, which essentially enhances the URDF with a Semantic Robot Description Format (SRDF) file. The URDF only contains information about how the joints and links are arranged, as well as some other information such as joint limits, and the visual and collision data. The SRDF doesn’t replace the URDF, but exists separately and contains other information, such as further self-collision checking, auxiliary joints, groups of joints, links and kinematic chains, end effectors and poses. So far I haven’t found any need to edit the SRDF directly, as it can be generated and edited by the setup assistant. The assistant generates a new ROS package with various templates for path planning and visualisation, which is done via an RViz plugin. So far I have managed to interact with the virtual Bioloid’s arms and legs, in a similar way shown in this PR2 robot tutorial. The aim will be to later on create some poses and walking gaits which I can try out on the real robot, but that is all for now! Moving an arm in MoveIt! Moving a leg in MoveIt! answers.ros.org – Can material colors be applied to Collada (.dae) meshes? This entry was posted in Bioloid project, Robotics and tagged 3D, axes, Bioloid, CAD, ROS, rviz, tf, transforms, URDF, xacro, XML on April 8, 2015 by dxydas. Updated the pages on some of my old CAD servo-robot designs as well as old robots, check the updated pages! This entry was posted in Site updates and tagged BEAM, brackets, CAD, Optimus Prime, robot arm, robots, servos, SketchUp on September 7, 2012 by dxydas.